MAQ Sonar is proud of its 5° Omni Directional Vertical Beam Width. The advantage of this beam width is what makes MAQ Sonar the Sonar of choice in shallow water and near surface fishing. How does it work for shallow water fishing? MAQ 5° Vertical Beam Width = 20 meters detection for each meter of water depth. 10° Vertical Beam Width = 10 meters detection for each meter of water depth. In 30 meters of water MAQ sonar will achieve 600 meters detection distance. In 30 meters of water a 10° Vertical beam Width will achieve 300 meters detection. Result: In shallow water on sand or silt the MAQ, with its 5 ° beam, will outperform the competition in detection distance. It will see fish at a further distance close to the bottom. Remember 20 x depth for 5° beam and only 10 x depth for 10° beam. 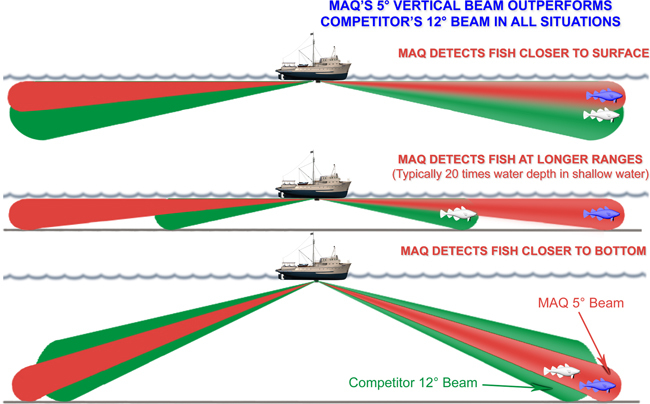 Result in shallow water on rock bottoms the MAQ with its 5° beam will outperform the competition in detection distance. Remember 10 X depth for 5° beam and only 5 X depth for 10° beam. In near surface fishing the 5° Omni Directional Vertical Beam Width means fish are detected closer to the surface before getting reflection back from the surface. The result is improved detection distance. And finally in fishing near the bottom with the narrow beam we have better separation of the fish school from the bottom.